Highly regarded for his ship’s portraits, Julius Stockfleth (1857-1935) emigrated from Denmark in 1883. He lived in Galveston until the hurricane of 1900, when most of his family drowned. During his time in Texas he painted the wharves and harbor of Galveston. Many of his paintings of sailing ships and the small coastal schooners that worked on the Texas coast were commissioned works. His correctly detailed ships portraits are reminiscent of another Danish painter, Antonio Jacobsen. 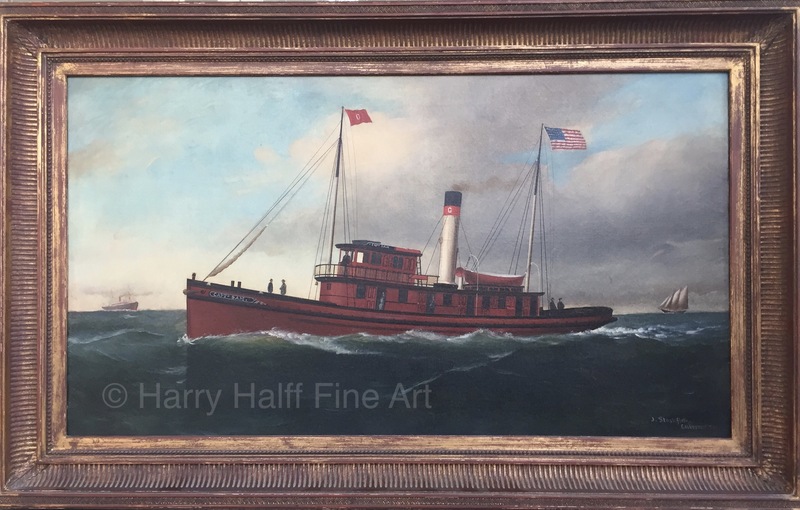 Harry Halff has been dealing in fine art for over 30 years. Located in San Antonio, Texas, the gallery specializes in buying and selling 19th century American paintings with an emphasis on Early Texas Art. We purchase and sell paintings by Julian Onderdonk, Robert Onderdonk, Jose Arpa, Theodore Gentilz, Hermann Lungkwitz, Mary Bonner, Thomas Allen Julius Stockfletch and other pre-1930 artists working in Texas. If you don’t see the painting you are looking for or have a painting you are interested in selling, feel free to Contact Us and we can assist you.